Shellawax Glow is identical in use and all other respects to regular Shellawax. It is applied in the same way and has all the same properties. It can also be mixed with Shellawax Cream as an extender and thinner and can be used over EEE-Ultra Shine. 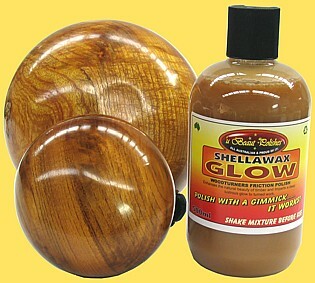 Shellawax Glow can be mixed with Shellawax Cream as an extender. This allows for better use of these products on large turned work and for hand rubbed work. For bowls over (6”) 150mm diam, mix the Cream and Shellawax Glow at the rate of approx 50/50 this will give you a runny cream that will stay on the surface longer and allow you more time to work it into the timber. Use different mixing rates for various jobs 20% Cream to 80% Shellawax Glow for large platters etc up to 900mm (3’) diam and larger. Use Shellawax as a thinner for Shellawax Cream, which often thickens with use. This will also extend the life of the Cream. The slight colour difference will not effect the colour of Cream when used. Guard against spills. - SHELLAWAX can act as a stripper on some painted & polished surfaces. - Wipe up spills immediately. - Spray from applying SHELLAWAX with the lathe running can make some floors very slippery.